Well, it's been about two weeks since I completed the 2016 Hallucination 100 mile trail run. My legs are back to normal and my feet feel fine although I don't always wear sandals in public so that I don't freak people out (at least 50% of one of my pinkie toes was blistered by the end). Our final donation total was $7,780 which exceeded both my primary goal of $5,000 and my secondary goal of $7,500. Perhaps as important to me as the financial total, was the number of people who made a contribution. 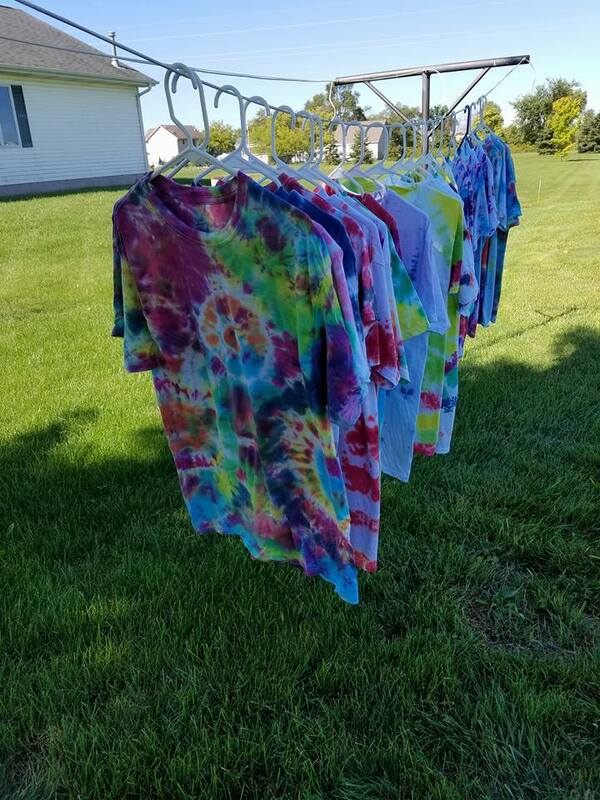 Around 73 people, many of whom knew Holli and some who did not, honored her memory with a contribution to the Children's Grief Center and I thought of many of the notes that were left with the contributions during my run. I was encouraged knowing that so many people still held memories of Holli in their hearts. I want to thank the boys' grandparents for all of their support throughout my training as well as during the race. My parents did an excellent job of supporting me as I went through each lap and Mike and Denise did a great job of shuttling the boys around (including a soccer game!) and getting them to the race. Thanks to Gina, who is the one who introduced Holli and I, for supporting the crew with pizza and cheering me to a finish. It still brings tears to my eyes when I think of the boys standing there near the finish line waiting for me. Thanks to Elliott and Oliver for sharing your energy with me. I'll keep my race report brief. The race consists of six loops of 16 miles each. The first two went by smoothly and uneventfully. 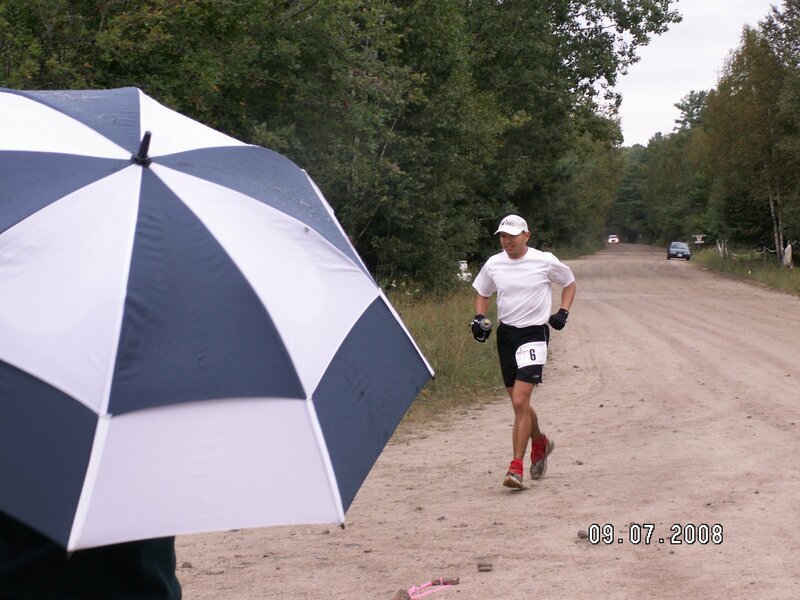 As I geared up for loop 3, I heard the gentle sound of rain on the aid station tent as I prepared to start the loop. It was about about 12:30 AM. The next loop was rough. The gentle rain soon became a downpour that made visibility difficult. The trail could not drain fast enough and soon I was running through water that was ankle deep in places. I ran through deep mud and through small streams. Needless to say, I was soaked. But it was cool and I was still feeling good and lost remarkably little time on the loop. I encountered a rather large raccoon that refused to move from the trail. It was strangely surreal, but I was moving along well. By loop 4, the novelty of running through the rain had warn off and the deep puddles and continued rain made changing shoes and socks an act of futility. I was tired. The weather had cleared up somewhat by loop 5 and the sandy soil had reduced the puddles, but there were still plenty of long tracks of deep mud. It was sunlight again, which always provides some encouragement but I was both physically exhausted and beginning to doze off while running. I knew that I had sufficient time to finish so I wasn't discouraged, but I looked forward to lap 6 and the sight of Elliott and Oliver waiting as I completed lap 5 warmed my heart. I even managed to jog out of the aid station before walking once I was out of sight. There was an inevitability to lap 6. I knew that I could finish. It was just a matter of not stopping. I tried to will myself to run, but could rarely manage more than 100 paces of a slow jog, then only 50 paces, before I had to walk. As the sun began to set again, I kept having the strangest hallucinations. I knew that they weren't real so they didn't really bother me, but the imagine of the runner stepping over a small fence was quite vivid even though I knew that nothing like that existed on the course. Trees became bears. The winding trail looked a lot like a snake. Sometimes it moved. I was dozing off again and with half of the last loop remaining I asked a nearby runner if he was walking the rest of the way. He was so I offered to walk with him hoping that some small talk would help keep me focused and moving forward. Dan's feet had suffered with the rain and we both avoided any discussion of blisters. 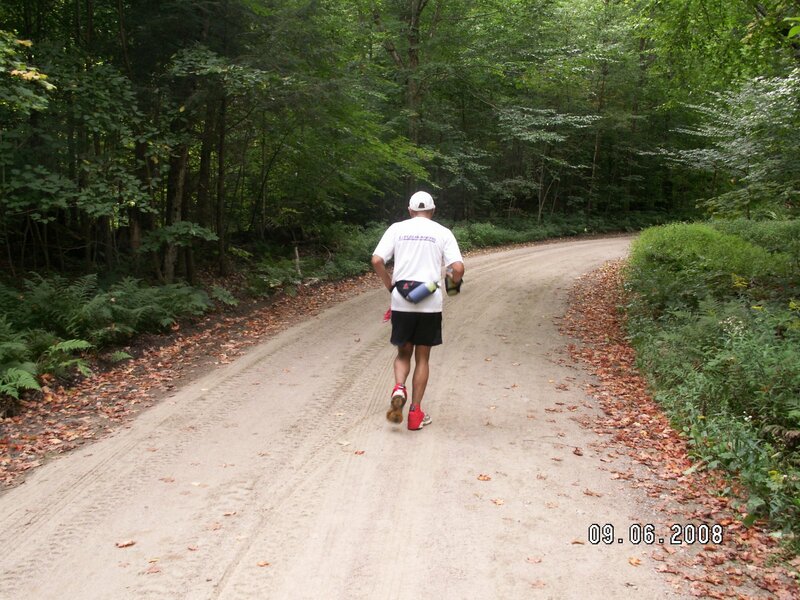 I'm sure that we made quite the sight shambling along those last few miles, but we kept moving forward. Elliott and Oliver shrieked in excitement when they saw me come around the corner. It's a little blurry at that point. We crossed the finish line together. Words don't do it justice. After everyone had left, Elliott stayed with me at the campsite. I thought about taking a shower, but the bathhouse was too far to walk to so I just changed clothes and collapsed into a sleeping bag. At 2 AM, I woke Elliott up and leaned on him as I shuffled my way to the nearby port-a-potty. I felt incredibly satisfied. Later, I saw that the night of rain took it's toll any only 71 of the 203 starters actually finished the whole 100 miles. That was going to be the finale, but I already know that there are only finales in movies and books. 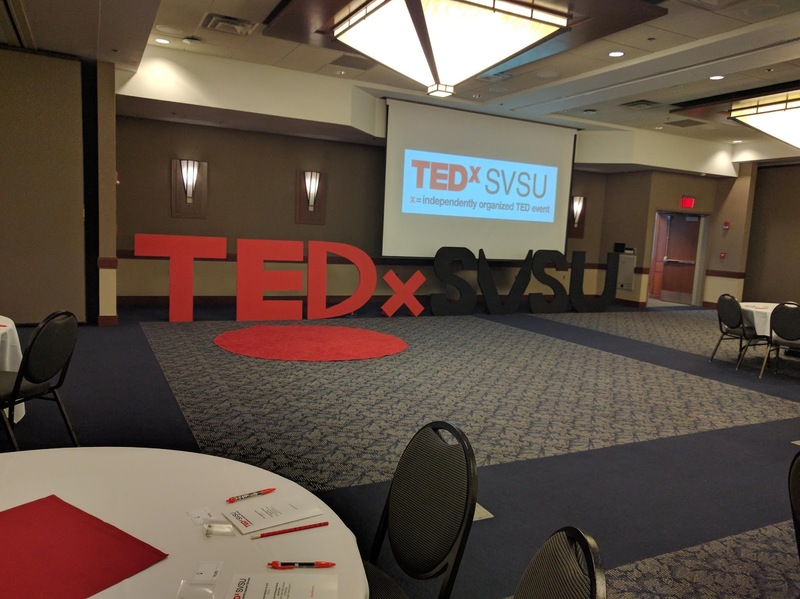 This Friday, I'll talk about my run and grief at a TEDx talk at SVSU (www.tedxsvsu.com) which will be the first time that I have ever talked about losing Holli in public. Speaking publicly about my feelings is not something that comes naturally. Okay, even speaking privately about my feelings doesn't come naturally. It feels important though. I've talked to too many people who have felt alone and isolated after suffering some tragic loss. I've had my share of setbacks and made my share of mistakes, but perhaps my experience and what I have learned from Holli will help others continue to move forward through difficult times. I guess I'm mostly working on getting emotionally prepared for the race. 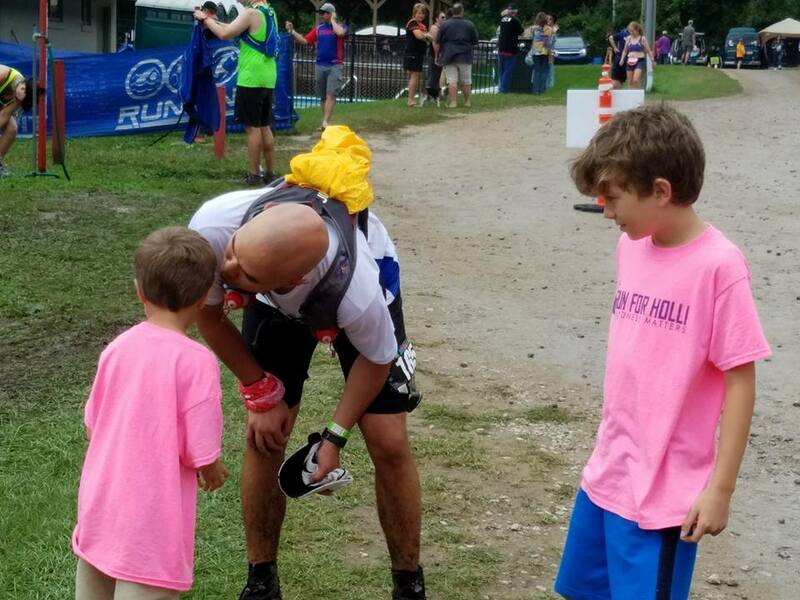 Even a normal race carries a certain emotional weight as you confront physical discomfort and exhaustion. Of course, this isn't a normal race and the races that I have run preparing for this one have given some insight into how I might feel this time around. In that typical male manner, I'm no superstar at communicating feelings and emotions, but I know that there will be a flood of feelings over the 28 to 30 hours I'll be on the course. Some of those feelings will be good and some won't. So I'm pleased to announce, with an ironic nod to the challenges I face talking openly about feelings, that I've been accepted to give a TEDx talk on ultrarunning and grief on September 30 at SVSU (http://www.tedxsvsu.com/). My hope is to talk about how running has helped me frame my life since losing Holli. The point that I hope to pass along is that the training for a race is more important than the race itself. The race is the easy part (er, easier). Training for the race is the hard part. But, of course, the talk isn't really about running. It's about trying to carve out a meaningful and fulfilling life after suffering significant loss. My life is certainly and unfinished and imperfect project, but perhaps some people will benefit from hearing about some of the things that have worked for me. You would be surprised at the number of hours I have already spent trying to put things into words, tossing drafts, and starting again. Perhaps to reiterate the point of the talk, my plan is not to "let words come" but to craft my talk and practice until it is something worthwhile. Keep your fingers crossed.